Welcome Bonus: $500 Welcome Bonus! The Jackpot City Casino was introduced in 1998 and is licensed by the Government of Malta. This site is operated by Belle Rock Entertainment and features top quality Microgaming software. The lobby of this online casino has a bright pink background and boasts an attractive bonus, promotions and an incredible progressive jackpot amount waiting to be won. The Jackpot City online casino is accessible in over 15 languages making this an appealing site in different places around the world. The Jackpot City Casino is powered by Microgaming, one of the big names in the online gaming software arena. This site offers both a download casino and a no-download flash casino. The Jackpot City Casino presents a large gaming selection of more than 400 games including slots, video poker, blackjack, roulette, keno, baccarat, poker, bingo and craps. In addition, there are also slots tournaments, blackjack tournaments and thrilling progressive jackpots. Jackpot City online casino is a part of the Microgaming progressive jackpot network that offers popular pursuits such as Mega Moolah, WowPot and Tunzamunni. This online casino is available in a variety of different languages to make the site appropriate for the global market. The languages offered include French, German, Portuguese, Turkish, Spanish, Russian and others. Jackpot City online casino also operates a mobile casino at which players may enjoy a variety of games from the convenience of a mobile phone handset. 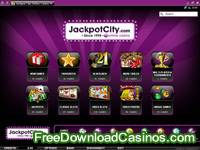 The Jackpot City Casino presents an appealing welcome promotion for newcomers. New players may take advantage of a free $500 bonus after registering at the site. This promotion involves a 100% bonus on a first deposit up to the amount of $200 and an additional100% bonus on a 2nd deposit at the site, up to $300. At this site, customers may benefit from a variety of promotions, such as monthly and weekend promotions, to enhance the player’s level of enjoyment at the site. The Jackpot City online casino hosts a VIP program that works according to a point system. In this plan, points are accumulated and then may be redeemed for casino credits. The Jackpot City online casino accepts over 28 different payment alternatives and deposits may be made in six different currencies. Among the choice of banking options at this site are credit card, Neteller, ECO, click2pay, clickandbuy, echeck, paysafecard, Ukash, webmoney, instadebit, usemybank and others. For the convenience of clients, basic information regarding each method is detailed at the site in a banking section. The Jackpot City Casino uses 128-bit encryption for the security of online transactions and data. This site is also eCogra safe and fair certified, verifying that the games at this site have been tested for fairness and honesty. The Jackpot City online casino presents an informative FAQ section covering a variety of topics. In the event that a player’s query is not answered in this page, then a 24 hour customer support service is available. Customer support staff may be contacted by telephone, e-mail and a live chat help service.